Say hello to a classy, lighter, dignified twist to the traditional calorie-laden sweet potato casserole. Offering all the warmth, sweetness and satisfying rich flavors you could ask for while cutting out a ton of butter, sugar and processed ingredients, this irresistible squash toss will have your Thanksgiving guests reaching across the table for more while keeping their waistlines fit for the holidays. The creamy-crunchy texture of the smooth squash and potatoes set off by the crisp crumble of candied pecans is a scrumptious, mouth-watering delight that will not disappoint, despite the trim ingredient list. Using a roasting method with minimal brown sugar or honey, this recipe creates caramelized morsels to entice your sweet tooth without packing on the pounds. Integrating butternut and acorn squash along with sweet potatoes produces a complementary flavor explosion that keeps your tastebuds on their toes. This fantastic, celebratory dish also boasts a savory list of nostalgic holiday spices and satisfying whole foods ingredients that will have you humming a very thankful tune!! Peel squash and sweet potatoes, clean out seeds and dice into one-inch cubes. In a large mixing bowel, toss squash and potatoes in a tablespoon or so of your choice of healthy cooking oil. Combine the brown sugar with the spices listed, sprinkle over squash and continue to toss until evenly coated. If using honey, mix the honey with the oil before coating the vegetables, then combine, sprinkle and toss in the rest of the spices. Spread the squash mixture in one layer on a large jellyroll pan or two cookie sheets. Roast in set to 425°F for 20 to 30 minutes, until pieces are still firm but can be easily pierced with a fork. Use a spatula to turn pieces after 10 minutes. This method creates a sweet, caramelized coating on the veggies, but if you need to alter it because of other dishes you are baking, the squash mixture can be placed in a covered dish and baked at 350 for about 40 minutes. While the squash is roasting in the oven, toast the pecans in a skillet over medium heat. Add a teaspoon or two of oil to a skillet and after the oil is warmed, stir the pecans in and sprinkle with a few teaspoons of brown sugar and a dash of salt. Stir constantly until the sugar melts and the pecans are toasted and glazed. Remove the pecans from the pan and set aside. 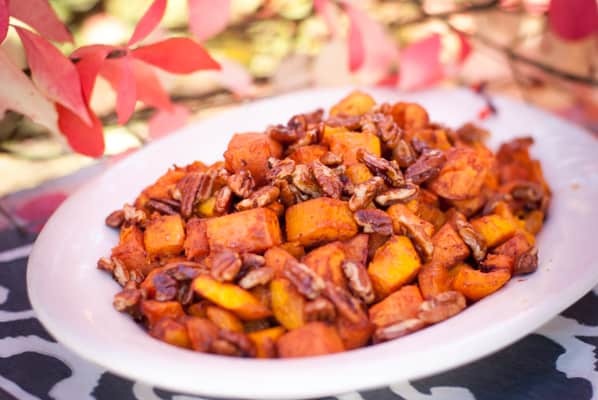 Transfer the roasted squash to a serving platter and sprinkle the candied pecans over the top. Enjoy!! That looks really good! I have a butternut squash I must get to really soon that won’t end up quite as pretty as this! This sounds delicious – I am going to try and make this weekend as I have some squash I bought a couple of days ago. I need to buy the Pecans though. This looks beyond amazing! I love the idea of adding the candied pecans. Yum! This would make the perfect dish at our Thanksgiving meal! Pecans are a favorite in our household! Yum! Pecans are the best! I hope you enjoy this dish as much as I do! Definitely pinning this for Thanksgiving! Thanks! What an honor to be featured at your Thanksgiving meal! This sounds delicious!! Pinned for later! Wow, this looks amazing. I could never peel, clean out the squash, chop and do all the rest of the prep in just 15 minutes though. I need to get speedier in the kitchen. I agree, Lisa! I apologize for the typo and will adjust it. I couldn’t do all that in 15 minutes either! It usually takes me closer to 25. A wonderful dish! Will note this one for the future. I must admit that this looks absolutely delicious and love the idea of the pecans being candied! I love acorn squash too. Lately, I’ve been into butternut squash and spagetti.squash. Going to roast the seeds on those and eat them as well.